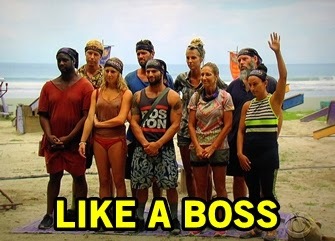 This week on Survivor features one of my favorite parts of every season: the Survivor auction! Everyone is given $500 to bid on food and other simple pleasures, or as the latest seasons have escalated: hold all your money to bid on an advantage. But this auction shows it means boss immediately after Will bids on a covered item, which ends up immediately kicking him out of the auction and sends him back to camp alone. I laughed so hard. But when he returns to camp alone he gets the easiest clue ever that says "Dig" with an X marking the spot (not to mention a flagged stick in the ground). He ended up winning a personal stash of rations to last the game which he can share or keep secret. Will decides to share it to win favor and show no hard feelings... until later, but I'll get to that. But back to the auction. When I see a plate of chicken and waffles I begin to drool and know my response to that would be, "$500, Jeff!" Shirin walks away with the food for $300, while Jenn wins a big cocktail, Sierra a plate of kebabs, and Rodney has a glass of red wine along with a steak. Carolyn, Mike, and Dan avoid all the delicious temptation, hoarding their $500 for the advantage that will likely be up for bid. But when letters from home are offered up, Shirin explains that Probst usually lets everyone buy the letter for whatever the offer is. Sierra buys for $20 a pop, so everyone else agrees to the letters including Mike, Dan, and Carolyn. But when the time comes to pick up his letter, Mike lingers in the back of the pack, turns around,and keeps all his money. SLICK MOVE! Well Carolyn is not having it returns her letter for a refund. Realizing this is the worst social move (if not totally baller), Mike pays the $20 so it's all even and fair and bleckh. The advantage is in a wooden box and Dan, Carolyn, and Mike are all in for $480. They draw rocks to see who wins it and Dan wins it. It's anti-climactic to watch, especially moreso when a doofus like Dan gets it. The reason Mike was going all-out for the advantage is that he earlier overhead Rodney tell his sub-alliance of three that he is gunning for Mike. Instead of letting this fester, Mike confronts Rodney at camp at the moment everyone is preparing to read their letters from home. A lot of people on the tribe consider this a violation of the sacred moment of family time, so Mike is now the camp pariah. Rodney immediately uses this to his advantage and begins buttering up Dan for his vote. Or votes. You see, Dan's advantage is he has earned a second vote at any future Tribal Council he wants. 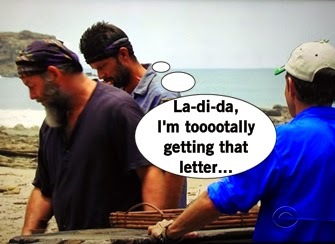 All he has to do is announce it before Probst says, "I'll go tally the votes." 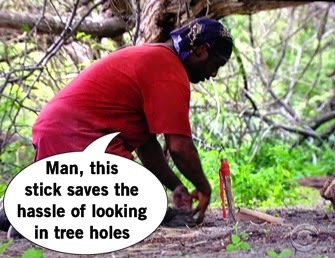 I'd love a loophole where Dan can never use it because Probst never says the word "tally" again. Anyways, this gives Dan a fair amount of voting power as he could double up votes on one person, or cast votes for two different people. But the biggest camp disaster of all is Will going OFF on Shirin in the most horrendous way possible, after it's relayed to Will that Jenn, Mike, and Shirin thought he didn't share all his food. Will's outburst is really personal saying no one at home loves Shirin. Shirin survived a home life of domestic violence, so hearing this is beyond repulsive and so personal. This motivates Jenn to want to stick around to really screw over the people she hates, the turds being horrible to Shirin. At the Immunity Challenge, Will asks Probst if he can sit out of this week's Immunity Challenge in order to receive his letter from home. New-school Probst is apparently always open to negotiations now and will allow it, but everyone on the tribe must agree to it. "Doesn't anybody reject?" Shirin raises her hand LIKE A BOSS. Revenge is sweet for our new Ice Queen Shirin. So Will has no letter and still has to participate in the challenge, which he'd lose anyways because he's horrible at challenges. The challenge is to carry a ball with big tongs across teeter totters, setting the balls into some candelabra looking thing. Mike and Tyler are the two frontrunners but a dropped ball crushes Tyler's chances, allowing Mike to take his time and secure immunity. While Will would like to eliminate Shirin because he can't stand her, Jenn is a bigger competitor and therefore the better target. Mike, Jenn, and Shirin have become a trio all of a sudden and agree to go after Carolyn AKA Mama C. The swing vote concern lies with Sierra and Dan, so Mike talks to Dan about that other foursome being tight. "Flippers never win" Dan doesn't buy for a second that the alliance of seven is imploding, because he has no common sense and/or this overwhelming desire to believing in loyalty. Mike reminds Dan that the two of them have been tight since day one while everyone else is using him to their advantage. Tyler brings up the group questioning Dan, he gets red-faced and flustered, insisting he makes his own destiny. Everyone wants Dan on their side and everyone is terrified of which side he'll chose. Tribal Council time! Earlier Will said to bring popcorn because it'll be the best Tribal ever, so he opens up right away about the secret food stash drama that happened at camp. Shirin points out that the food argument lasted a hot second before Will turned super personal, leading her to tear up. As Shirin opens up about her emotional past, Will keeps saying he didn't attack her personally and all I want is for someone to say, "STFU, Will. You are awful." The Blue Collars talk about how they were tight for a long time but the time is coming to turn on each other to win. Mike uses his time to bring up the alliance of four and that they'll walk all the way to the end. Rodney uses the emotional appeal, bringing up that Mike was going to deny people letters for a chance to get ahead. Shirin openly discusses that she expects the votes to be split between herself and Jenn, with Dan and Sierra being the swing. The other side denies that Dan and Sierra are swing votes, insisting it is a strong six. Basically, this Tribal Council is an emotional mess and I have no idea what's going to happen. And then Jenn gets eliminated, meaning all those turds remain in the game. Ugh, are we supposed to like who will end up winning this season because it seems REAL hard right now.